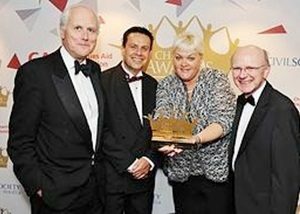 June 13, 2014 – Newham All Star Sports Academy (NASSA) has received the ultimate accolade by being announced as Charity of the Year in The Charity Awards 2014 – the most prestigious awards programme in the charity sector. The highly coveted honour was announced last night at a star-studded awards evening hosted by comedian Stephen Frost at London’s Grosvenor House Hotel. Earlier in the evening, NASSA was chosen as winner of the Children and Youth category because of the impact that our Carry A Basketball Not A Blade (CABNAB) initiative has had on our young people and the local community in east London. The overall Charity of the Year was then selected from the 10 category winners. For NASSA it is the highest possible praise for the work that began with an impromptu basketball coaching session in an east London park in 2005.